Physical inactivity, defined as achieving less than 30 minutes of moderate intensity physical activity per week, is the fourth greatest risk factor for poor health in the UK, exceeded only by smoking, high blood pressure, and a high body mass index (BMI). Approximately 3.2 million deaths each year are attributable to insufficient physical activity. Physical inactivity directly contributes to 1 in 6 deaths in the UK. The World Health Organisation (WHO) determined that approximately 31% of adults over 15 years old and over were insufficiently active in 2008, with males being slightly more active than females (28% vs. 34% inactive, respectively). Inactivity was highest in the Americas and Eastern Mediterranean, where almost 50% of women were insufficiently active in both these regions. 40% of men were found to be insufficiently active in the Americas, whereas in the Eastern Mediterranean, in was determined to be 36%. 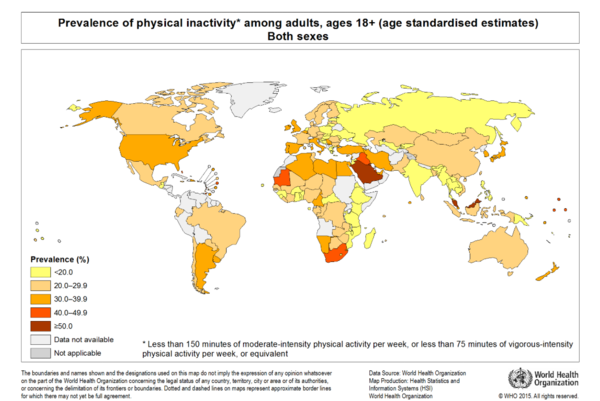 South East Asia showed the lowest percentages of physical inactivity, that being 15% for men and 19% for women. In almost all countries, WHO found that men were more active than women. The physical, economic and social environments in which modern humans sit or move within the contexts of their daily lives have been changing rapidly, and particularly so since the middle of the last century. These changes — in transportation, communications, workplace and domestic-entertainment technologies — have been associated with significantly-reduced demands for physical activity. Physical activity clearly leads to increased physical fitness, exercise capacity, and risk reduction of a wide variety of pathological diseases and clinical disorders resulting in lower rates of morbidity, all-cause and cause-specific mortality, and increased life expectancy. More specifically, physical inactivity increases the risk of coronary heart and cerebrovascular diseases, type 2 diabetes mellitus, hypertension, several cancers (e.g. lung, prostate, breast, colon, others), osteoporosis/fractures and dementia, among others. However, even among the very old “not only continuing but also initiating” physical activity is associated with better survival and function. 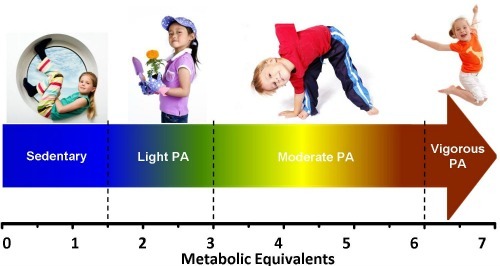 Moreover, since there is a linear relationship between the level of physical activity and health status, children and adolescents should participate daily in 60 minutes or more of moderate to vigorous physical activity that is enjoyable, involves a variety of activities, and is developmentally beneficial. Sedentary behaviours (from the Latin sedere, “to sit”) include sitting during commuting, in the workplace and the domestic environment, and during leisure time. Common sedentary behaviours include TV viewing, video game playing, computer use (collective termed “screen time”), driving automobiles, and reading. Sedentary behaviours such TV viewing, computer use, or sitting in an automobile typically are in the energy-expenditure range of 1.0 to 1.5 METs (multiples of the basal metabolic rate). In general this means that any time a person is sitting or lying down, they are engaging in sedentary behaviour. In contrast, moderate-to-vigorous physical activity such as bicycling, swimming, walking, or running may be done in a variety of body positions, but require an energy expenditure of 3 to 8 METs. In this perspective, light intensity activity behaviours are those done while standing, but that requires expenditure of no more than 2.9 METS. Where we live affects how we live. Sidewalks, protected bike lanes, street designs that slow traffic and make it safe to cross, parks, gyms, shops and other destinations within walking distance-all of these neighbourhood features can make a difference in how active we are. A myriad of reasons keep many people off their feet, but the so-called “built environment” or man-made world, with its cities and neighbourhoods, streets and buildings, parks and paths, plays a major role. Our social surroundings matter too. Supportive families and coworkers, for example, may make it easier for people to get up and get moving. The multitude of factors that induce adults to initiate and maintain programmes of physical activity have been divided into those that are invariable (age, gender, race, ethnicity) and those that are presumed to be modifiable (behavioural and personality characteristics, environmental circumstances and community settings). There might be more widespread use of innovative technologies that can provide more opportunities to reduce sitting time (for example, height-adjustable desks) or new regulations in workplaces to reduce or break-up extended periods of job-related sitting. Active transport modes could be promoted not only as opportunities for walking, but also as alternatives to the prolonged periods of time that many people spend sitting in automobiles. Providing non-sitting alternatives at community entertainment venues or events might also be considered.Our surroundings and the policies that shape them have a substantial impact on where, when, how, and how much physical activity we get on a daily basis. Just as our lack of physical activity is a major contributor to the obesity epidemic, creating an activity-friendly environment is one way to help turn around the epidemic. There are many elements to an activity-friendly environment: buildings, streets, and communities that encourage walking and biking; parks and playgrounds that are plentiful and appealing; and neighbourhoods where people feel-and are-safe, to name a few. Physical activity behaviour is influenced by both individual characteristics and the social environment. Whether or not an individual is physically active depends on demographic characteristics such as gender, age, and ethnic background, and on socioeconomic characteristics such as education and income level. Therefore, urban centres have more roads, cars, and car travel, and less walking or biking for transportation or leisure. They have more densely populated neighbourhoods, and less outdoor recreational space. They offer more exposure to mass media marketing of food and beverages, which can shift people’s preferences away from traditional diets. Finally, urban centres have more sedentary jobs (such as manufacturing and desk jobs) and fewer active jobs (such as farming). Sedentary behaviour can occur in 4 areas of children’s lives — education/school/child care, transport, self-care/domestic chores, and leisure/play. For school-aged children, a main “occupation” is being a student and the majority of the school day is spent sitting. Homework also contributes to additional sitting time. Transport time is usually highly sedentary with children sitting in buses, trains and cars to get to and from school and other destinations. Sedentary self-care tasks include eating and some grooming. Leisure and play sedentary behaviours include reading from a book or an electronic screen. There are a number of ways by which sedentary behaviours may influence child health and development, including disrupted metabolism, limited neuromuscular activity, prolonged/awkward postures or repetitive motions, socio-emotional experiences, cognitive experiences, and other mechanisms such as influencing sleep quality. Family can be the seedbed for a physically active life. Studies show that parents are particularly important as models, encouragers, and facilitators of physical activity in children and adolescents. Their roles include everything from buying sports equipment and taking kids to practice to paying fees and doling out praise. Other important factors in raising active children include paternal activity levels and positive reinforcement, maternal participation, sibling involvement, time spent outdoors, and family income. Among adolescents, time spent watching TV has been linked to substance use, reduced self-worth and self-concept, reduced bone health, increased risks for markers of metabolic syndrome and cardiovascular disease, poor pro-social behaviour, increased aggression, reduced academic achievement, depression and reduced quality of life. Crucially, sedentary behaviours track from childhood to adolescence and into adulthood. With most stating that adolescents should spend no more than 2 hours per day engaging in sedentary screen-based activities such as TV viewing. Policy makers in areas such as health, education and welfare should be aware of the importance and benefits of reducing sedentary behaviours among youth. Effective strategies for reducing the time that young people spend being sedentary include interventions that support active transport and active play within schools, families and communities. Connections between built environments and physical activity have been documented for children and adolescents. Living in proximity to parks and other recreation facilities, as well as high aesthetic qualities, has been associated with higher physical activity among youth. This can be interpreted as suggesting that children need suitable places to play near their homes. Adolescents living in walkable neighbourhoods are usually found to be more active than their suburban counterparts. More young people walk or cycle to school when they live in walkable neighbourhoods. However, children may use cul-de-sacs as play areas because traffic is low. Thus, suburban road networks with low connectivity may simultaneously reduce walking to school and facilitate active recreation among youth. For youth, there is better evidence that sidewalks are associated with high physical activity levels. School grounds designed for a variety of activity opportunities may stimulate more activity during free time, such as after lunch. Young people generally seem to benefit from the same built-environment factors as adults, but there are additional settings (e.g., schools) and activity behaviours (e.g., walking and cycling to school) that must be considered for youth. A large proportion of adults in Western cultures are physically inactive, despite several decades of warnings about the potentially negative health consequences of a sedentary lifestyle. Successful interventions tailor programmes to individual needs, account for personal levels of fitness, allow for personal control of the activity and its outcomes, and provide for social support by family, peers and communities. The initiation and maintenance of regular physical activity in adults depends on a multitude of biological and sociocultural variables that demand attention across the lifespan. The Behavioral Risk Factor Surveillance System (BRFSS) and the National Health Interview Survey (NHIS) have revealed that physical activity levels of U.S. adults decline with age and are lower among women, ethnic and racial minorities, those with less education and low income levels, the disabled, and those living in the southeastern region of the United States. Adults who live near parks and other recreation facilities generally do more recreational and total physical activity. This association has been documented in numerous studies, but due to the wide variety of methods used, it is not possible to quantify the effects. The aesthetics of recreation facilities and communities in general have been linked with physical activity. Other built-environment characteristics have not been studied enough or have yielded inconsistent results, including sidewalk presence and quality, other road characteristics, availability of parking, and hills. Just a few studies of built environments have been reported for adults aged 65 years or greater. The results generally confirm that the physical activity associations with walkable community designs and proximity of recreation facilities generalise to older adults. These are adults with serious difficulty walking or climbing stairs; hearing; seeing; or concentrating, remembering, or making decisions. Adults with disabilities are three times more likely to have heart disease, stroke, diabetes, or cancer than adults without disabilities. Aerobic physical activity can help reduce the impact of these chronic diseases, yet nearly half of all adults with disabilities get no leisure time aerobic physical activity. Doctors and other health professionals can play a role in promoting physical activity among their adult patients with disabilities. Adults with disabilities were 82% more likely to be physically active if their doctor recommended it, compared with if they did not get a doctor recommendation. However, only 44% of adults with disabilities who visited a doctor in the past year received a physical activity recommendation from their doctor. ↑ 1.0 1.1 NHS Atlas of variation in healthcare. Department of Health. 2015. p94-95. http://www.rightcare.nhs.uk/atlas/2015_IAb/atlas.html (accessed 01 July 2016). ↑ 2.0 2.1 2.2 World Health Organization. 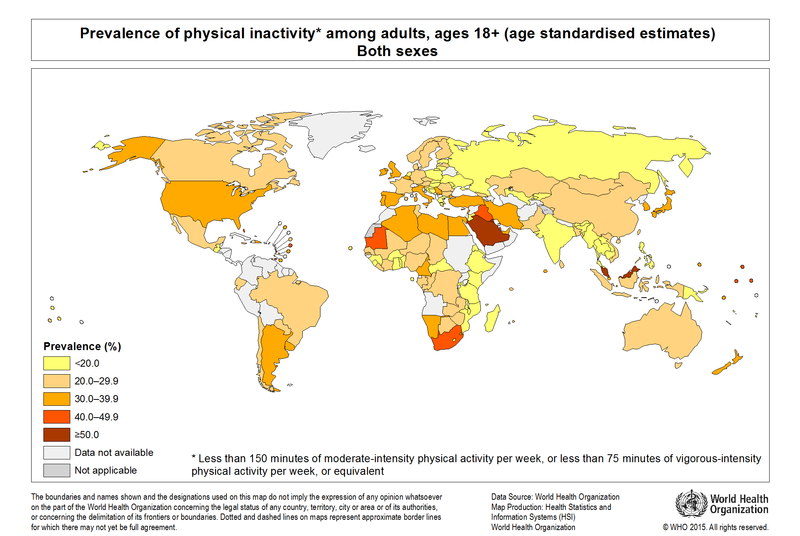 Physical Inactivity: A Global Public Health Problem. http://www.who.int/dietphysicalactivity/factsheet_inactivity/en/ (accessed 01 July 2016). ↑ 3.0 3.1 Knight JA. 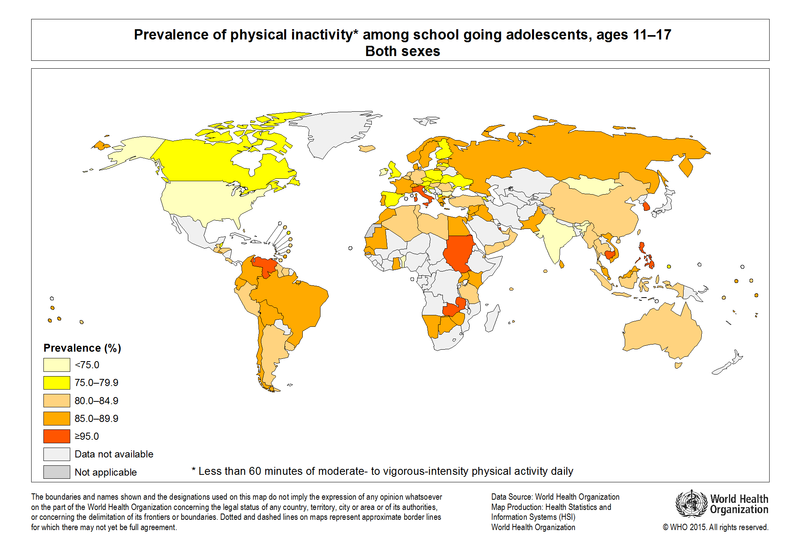 Physical Inactivity: Associated Diseases and Disorders. Association of Clinical Scientists. 2012. ↑ 4.0 4.1 4.2 4.3 4.4 4.5 4.6 Owen N, Healy GN, Matthews CE, Dunstan DW. Too Much Sitting: The Population-Health Science of Sedentary Behavior. Exercise and Sport Sciences Reviews. 2010. ↑ 5.0 5.1 5.2 Sedentary Behaviour Research Network. Standardized use of the terms “sedentary” and “sedentary behaviours”. Appl Physiol Nutr Metab. 37: 540–542. 2012. ↑ 6.0 6.1 6.2 Harvard T.H.Chan. Obesity Prevention Source. Environmental Barriers to Activity. https://www.hsph.harvard.edu/obesity-prevention-source/obesity-causes/physical-activity-environment/ (accessed 02 July 2016). ↑ 7.0 7.1 Seefeldt V, Malina RM, Clark MA. Factors affecting levels of physical activity in adults. Sports Med. 2002. ↑ 8.0 8.1 Transportation Research Board, Institute of Medicine. Does the Built Environment Influence Physical Activity? Examining the Evidence - Special Report 282. Chapter 6: 4 Contextual Factors Affecting Physical Activity. 2005. ↑ 9.0 9.1 9.2 9.3 Leon Straker, Erin Kaye Howie, Dylan Paul Cliff, Melanie T. Davern, Lina Engelen, Sjaan R. Gomersall, Jenny Ziviani, Natasha K. Schranz, Tim Olds, Grant Ryan Tomkinson. Australia and Other Nations Are Failing to Meet Sedentary Behaviour Guidelines for Children: Implications and a Way Forward. JPAH 13:177 – 188, 2016. ↑ Hancock J, Inchley J, HBSC’s Physical Activity Focus Group. Sedentary Behaviour. HBSC’s International Coordinating Centre. http://www.hbsc.org/publications/factsheets/Sedentary-Behaviour-english.pdf (accessed 01 July 2016).